Isuzu Pedders Suspension Kit Roger Young Isuzu are pleased to announce a great new addition to the Isuzu ProParts range. Roger Young Isuzu are pleased to announce a great new addition to the Isuzu ProParts range. The Isuzu D-Max Pedders suspension kit enhances the ride comfort and handling characteristics of the Isuzu D-Max double cab. With the new Pedders kit fitted, the Isuzu D-Max ride characteristics becomes similar to that of a saloon style vehicle with the added benefit of enhanced ride quality, while maintaining the current load carrying capabilities. 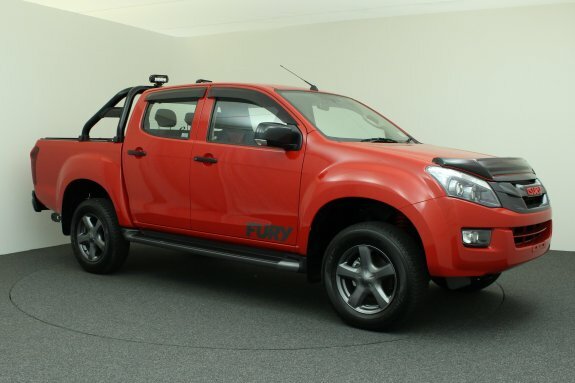 Because Isuzu D-Max vehicles are used as both a work horse and and a family vehicle the Pedders suspension kit was designed to fulfil both roles. The spring and shock absorber rates were developed to provide enhanced ground clearance, increased suspension travel while improving vehicle stability on all road surfaces.This kit provides enhanced articulation on uneven road surfaces and improves tractability of all four wheels in difficult situations. The increased ride height of 35mm to 40mm enables the Isuzu D-Max to have the ability to cover very rough ground, as well as enhancing the entry and exit angle of undulating terrain. Pedders Trak Ryder Rear Foam Cell Shocks. Pedders Trak Ryder Lift Kit Rear Leaf Springs. Pedders Ezi Fit Front Foam Cell Shocks & Springs. Rear Spring Leading and Trailing Polyurethane Bush Kits. U Bolts for Rear Springs.